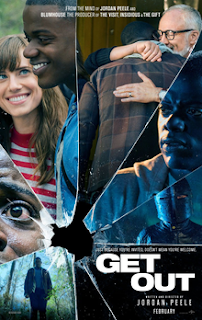 It had gotten to the point that I had heard so much about Get Out that I felt I was missing out on something if I didn't see it. This movie is definitely a slow burn, but it is a clever film once it gets moving. Writer and director Jordan Peele (yes, of Key and Peele fame) did his best to disguise where the movie was headed for as long as he could, and when it all started to fall together it did so with such geometrically perfect pieces that this movie has to be considered a potential classic that will last for generations. I went into this movie with the completely wrong frame of mind because I was told it was a horror film. Even if it is categorized as such on your favorite movie database, Get Out is definitely not a horror movie. It takes a while to grab your attention and, truth be told, I almost gave up on it 30 minutes in. But once the ride really starts, you quickly realize that this is a psycho thriller the caliber of something like Psycho or even The Blair Witch Project. That is lofty company, but it is the company Get Out keeps. The movie starts out harmless enough, but I have to admit that it does have that "kids go stay in a cabin in the forest" horror movie feel to it. Like I said, this is not a horror movie, but I guess I can see why some people think it might be. It is hard to describe and you would have to see the movie to understand what I am trying to say, but you can tell right from the beginning that something is just not right. The young couple seem happy enough and the set-up is believable, but when it starts to roll it just feels all too familiar. I have to think that Peele did that on purpose because, slowly, that familiar feeling you had with the movie early begins to unravels. It is replaced with the idea that you are not quite sure exactly what you are watching and you have no idea where it could go. There is a point in the movie where I threw my hands up in the air and just said "Ok, I have no clue what is going on." But like a car wreck on the 990, I could not look away. Even when the movie starts to slowly reveal what is really going on, you still doubt what you are seeing. It isn't until the movie only has about 30 minutes left that the pace speeds up and things really start to happen. If this review sounds vague to you then that is on purpose. I simply cannot talk too much about the movie without giving away key plot elements. I have a "no spoilers" policy and I am not going to break it now. But I will say that if you look closely at the movie poster, it gives you much more insight into what is going on than you may think. Get Out is a very clever movie that comes to a thrilling conclusion. It has the inevitable moments you just have to forgive, such as using a bare amount of cotton in the ears to block out a lot of sound. But once you get past all of that, you are left with a movie that is funny, exciting, and a complete mystery almost to the very end. There is a scene close to the end that I can tell you is a critical moment in the film. The hero of the movie starts to realize what is going on and has decided it is time to leave his girlfriend's parents house. The problem is that he is not sure who is in on the whole thing, and he confronts all of the guilty parties at once hoping for an ally. As he slowly realizes he has no allies, his will breaks down and it is a masterful piece of acting by Daniel Kaluuya. It looks like this one is headed for the PPV circuit and then blu-ray. I would highly recommend that you do not wait for this one to get to cable and invest in a PPV viewing or a blu-ray instead. This is a movie you will want to watch more than once because it is simply that good. George N Root III is a movie fanatic who likes to think that he knows a classic when he sees one. Follow him on Twitter @georgenroot3, or send him a message at georgenroot3@gmail.com.